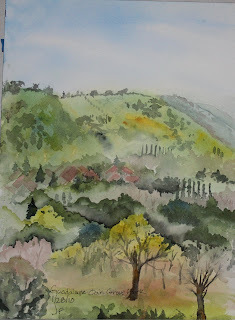 Last Thursday was the first sunny day in the past week and a half, and the Plein Air group from the SCVWS went to Guadalupe Oak Grove Park in Almaden Valley. It's a beautiful park and well-used; we saw hikers, runners, dog walkers and a workout group. Someone asked if we were birdwatchers-I'm not sure that's a compliment! There's a wonderful rocky cliff face, but I didn't see it soon enough and rather ambitiously decided to paint the view across the valley. The deciduous trees have a warm glow about them right now, as their buds are beginning to swell. I was surprised by how many columns of Italian cypresses there were in the landscape. This is so Lovely, I love you color choices and of course your drawing is so wonderful too. I live next to that park and you're right it's a busy one. But so beautiful like your painting! Thanks, Sheila. I hope to getback to the park soon. My painting class at Mission began yesterday, so maybe I can start getting more work done. Hope to see you soon.